The real-life Venus of Hohle Fels is the oldest undisputed example of figurative art in the world. This is an object that certainly withholds more than it gives up; people have been projecting history and meaning onto and about it since its discovery in 2008. Personally, I like the idea that it is – for now – the primary and therefore most authentic artwork: a kind of ur-sculpture. In his 2010 film Cave of Forgotten Dreams, Werner Herzog, under the influence of Jean Clottes and other writers on prehistoric art, talked about the idea that prehistoric artefacts from this era evidence self-awareness and therefore can be seen as objectifying the dawn of human consciousness. So the Hohle Fels sculpture is like an avatar of an emergent self-awareness – out of the darkness: light, the birth of the idea, the appearance of caveman-lightbulb above caveman-head. 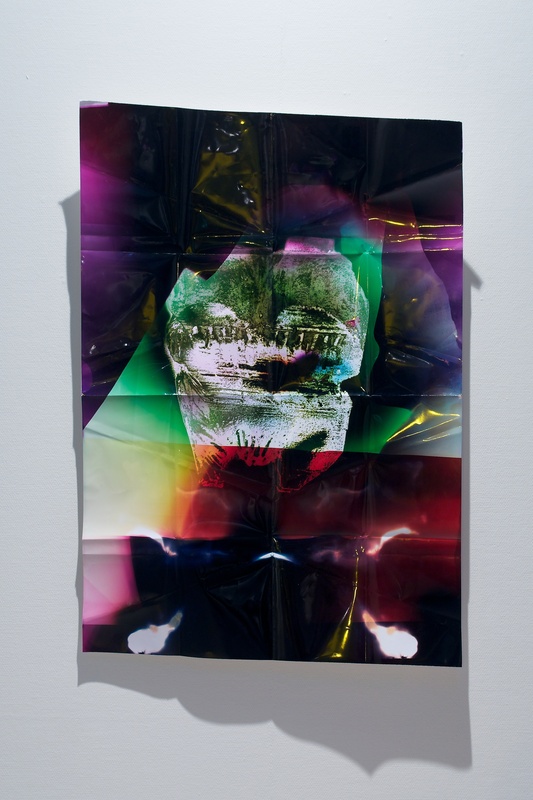 This print [above] and 97 others were made, manually, in Chris Bloor’s bathroom and study, in his house in Baildon, using crude equipment – torches, color-gels, acetates, developing fluid, a darkened room – shining light at and through my fake of the world’s oldest figurative sculpture. In the Ourhouse story my friend David Birkin plays Truson, who is one of the main characters. Truson is a person who cannot lie. His name is a conflation of ‘true son’  and he represents a variation on the ‘holy-fool’ archetype, a kind of savant who exposes the pretence of other characters relative to his own innocence. He is almost mystical in this sense, a truly beatific person. Truson has ordered the fake Venus on the Internet and it arrives at the house by post  near the beginning of Episode 1. To the viewer and to the other characters in the story, the sculpture that arrives is transparently un-prehistoric. It is a modern fake, at least five times larger than the original, newly and crudely manufactured on a band saw, leaving it with an anomalous and clunky cubic aspect. But Truson cannot conceive of the idea of something being fake. He engages with reality on a primary, ontological level; everything that is, is equally real to him. So for Truson his Venus is entirely authentic; it simply is. And when any other character in the story describes the Venus as looking ‘fake’ he becomes confused and distressed. The idea of the fake Venus is a running joke – a joke on the art-historical authenticity of the object, a joke on the subjectivity of idolatry and a joke on the contextual and referential strategies used to inscribe value in contemporary art production. I am engaged in a parallel process, using my scripts and films as a combined locale and rationale for the production of work in other forms. This rationale forms the basis for all of the Venus of Truson photograms, including those that appear completely abstract. We have produced 97 photograms across four series, each on a different scale. The process is unpredictable: each print comes out quite differently and is a completely unique artefact. This photogram is the tenth print in Series #4. It is the 90th photogram we have made. Series #4 are all really big and they are folded prior to development – we didn’t have a bath big enough to develop them in, so they ended up acquiring an extra-sculptural dimension. All of the photograms in this series involve a play on the authenticity of the contemporary art object in relation to pre-history and modern modes of reproduction. 1. We contemplate a return to the cave. 2. All of the photograms are made by hand in total darkness. 3. The photogrammic production process is chemical and unstable, resultantly each print is unpredictable, analogue and unique. 4. These colour photographic development techniques are themselves: prehistoric to digital culture. 5. The photograms incorporate movements between subject and object, (pre-) historic and contemporary, instinct and technique, darkness and light, original and fake. 6. The photograms reassert their subject’s authenticity; they objectify it. 7. Ontological ping-pong: the entire Ourhouse film/video series and its ‘movements’ (see 5.) between points of formal and conceptual opposition can be read as an absurdly complicated way of making a series of prints, i.e. through the reverse lens of the photograms the Ourhouse film/video series becomes an elaborate projector for a different form of artwork. The photograms are born, subject and object, out of the Ourhouse script. I don’t think we will make any more based on this particular object. I like the idea that they have their own time; 2011–12. What I am most interested in is a methodology that is a form of studio production determined by an original script and video series; it is a mode of conceptual art which is both pre- and postproduction. It is before and after sculpture. 1 A photogram is a form of camera-less photography, an unique print made without a negative by directly exposing an object to light-sensitive paper. Photograms have been fundamental to the development of the photographic medium – Anna Atkins’ 1847 book British Algae: Cyanotype Impressions included her botanical photograms and was the first book to be illustrated with photographic prints of any kind. In the 20th century, Man Ray’s direct exposures of familiar objects established a popular archetype for the form. Pablo Picasso, Laszlo Moholy-Nagy, Len Lye and many other artists have made photograms in different styles, using varying techniques. 2 in the bathroom in Chris Bloor’s house, near Baildon, outside Leeds, inside Yorkshire. 3 I’ve erroneously described this series as ‘absurdist’, suggesting that Ourhouse is a work made in a specific form. To be more precise Ourhouse is an artwork exploring the coalescence of language, power and form with some absurd results. 4 He is the first son of ‘Daddy’, Charles Maddox-Wilson (played by Richard Bremmer), middle-class-artist-alchemist, counter-cultural-remnant, patriarchal centrifuge and owner of the house. 5 The ‘post-box’ in Ourhouse is dematerialised; it is a hedged area at the border of the property. The inside and the outside of the property are symbolic entities. Truson has to furtle in the undergrowth to collect the mail. 6 In the mannered register of an artist’s manifesto. 7 Nathaniel Mellors – The Nest, Cobra Museum of Art, 10 December 2011 – 4 March 2012. Nathaniel Mellors was born in Doncaster in 1974. He studied at the Ruskin School, Oxford University (1996-99) and the Royal College of Art, London (1999-2001). In 2007-09 he was resident at the Rijksakademie van beeldende kunsten, Amsterdam. The manipulation of language is a core theme in his work. In addition to his script-writing, film, video, performance, collage and sculpture, Mellors is/ was a member of the groups God in Hackney, Advanced Sportswear and Skill 7 Stamina 12. He is a co-founder of Junior Aspirin Records. He lives and works in Amsterdam & London. Posted on June 5, 2012 February 22, 2015 by vsmallfires	This entry was tagged David Birkin, Nathaniel Mellors, photogram, Venus of Truson. Bookmark the permalink.